When, Sept. 16, the medium bomb group of the 10th Air Force pounded targets in Burma at Maymyo, Ywataung, Saigang and Monywa, it was not merely "another raid." It was Organization Day for the group, which had its cake and ate it, too. The three squadrons - "Bombing Eagles," "Bomb Jockeys" and "Skull and Wings" - brought along small cakes decorated with birthday candles which were eaten aloft during a typical mission in which they faithfully carried out the group's motto: "Strike With Fury." The group was born Set. 16, 1942, in the western Indian desert country, where it spent until January training under Lt. Col. Torglis G. (Torgie) Wold. From here, the first raid was undertaken. The planes took of from the desert, refueled at an Assam base and successfully bombed their target. One Mitchell was lost. Two of the crew members walked back; the remaining three were presumed to have fallen prisoner to the Japanese. In December, the "Bombing Eagles" packed up and moved from the desert to a base in Assam, with Maj. Frank Sharp as their first commander. On the 14th of the month, this unit staged its first raid, scoring 18 direct hits upon Myohaung Junction, They were lone wolves for a month, then the "Skull and Wings" and the "Bomb Jockeys" made their appearance in the area. Wold has since gone back Stateside on an important assignment and Lt. Col. James A, Philpott, for "Skull and Wings" commander, is now guiding genius of the group. The scoreboard for the first year of action reveals 300 missions undertaken, eight confirmed enemy planes shot down, 12 probables and 15 destroyed on the ground - at a cost of six B-25's, 16 officers and 11 enlisted men. The "Bombing Eagles" were born May 1, 1942, at Columbia, S.C., where they spent a month under Maj. (then 1st Lt.) Robert S. (Alabama Bob) Puckett before sailing for India. The squadron was assigned to a heavy bomb group before its activation Sept. 16. Since the first raid on Myohaung Junction, the "Bombing Eagles" have been welded into a magnificent striking force, as they proved on Organization Day by trailing 400 bombs across Monywa, one of the largest most-important oil centers in Burma. Members of the "Bomb Jockeys" squadron talk over detailed plans of the mission. Six officers have compiled more than 260 combat hours, topped by Lt.C. D. Brewes with 280:30. His running mates are Puckett, who shows no "arm chair" proclivities, Lt. J. R. Amann, Lt. A. J. Porter, Lt. L. G. Brown and Lt. W. M. Thomas. Six enlisted men have had more than 210 hours: S/Sgt. A. E. DeWalt (leading with 277:45), S/Sgt. G. B. Crandell, T/Sgt. D. E. Wood, S/Sgt. A. E. Hillyer, Sgt. J. M. Yenne and S/Sgt. G. G. Danfield. First target of the "Bomb Jockeys" was the famous Myitnge Bridge, which they cut loose at in January, led by Maj. Blair M. Sorenson, now lieuetenant colonel and group operations officer. Their original leader, the Lt., now Major Edward M. Garrett, has piled up 248 combat hours and has crossed the Chin Hills into Burma 42 times. Garrett is one of six "Bomb Jockeys" officers with over 220 combat hours. The others are Lt. Leslie L. Davidson, Lt. Conner C. Griffen, Lt. Robert H. Ruick, Lt. Leonidas V. Keck and Capt. Frank O. Redman. A half dozen enlisted men boast 210 hours or more in action: T/Sgt. Delmar C. Harland, T/Sgt. James Ruska, S/Sgt. Jackson E. Branner, T/Sgt. John D. Butler, Sgt. William E. Dermott and Sgt. Paul E. Wiggenton. The "Bomb Jockeys" were the first to lose a man when Lt. Carl Wafford, a co-pilot, was killed in the first brush the squadron had with Zeros, one of which were destroyed. On Organization Day, the "Bomb Jockeys" wreaked heavy damage at Ywataung and Sagaing. For the "Skull and Wings," the Organization Day raid was mission No. 98. At its inception, the squadron was composed of a handful of officers and enlisted men, mostly hailing from China, with Philpott, now group commander, as its C.O. Philpott led the unit in its first action back in February when six planes joined others of the group to bomb the Saigang Railway Yards. 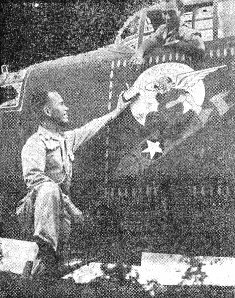 Capt., now Maj. Robert D. McCarten led the mission in which the "Skull and Wings" knocked down their first confirmed planes. Jumped May 13 by 10 Zeros and one ME 109 following a mission directed against Thazi Railway Junction, the squadron accounted for two Zeros certain, two probables and three damaged. A week later, a flight of nine B-25's were jumped by 25 Zeros over Chauk. Five were destroyed, six were damaged and three were recorded as probables. One Mitchell was lost. 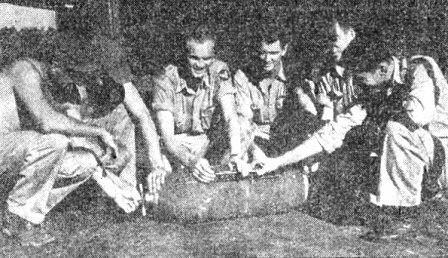 The "Bomb Jockeys" were one of the three squadrons of the 10th Air Force's medium bomber group to stage an Organization Day raid in Burma. Left, Capt. F. O. Redman, who led the flight, receives a birthday cake from Lt. Col. Blair M. Sorenson, group operations officer, prior to the takeoff. Right, the motors of one of the Mitchells is turned over before being warmed up. CHINA - Capt. John M. Morrison, serving with a fighter squadron of the forward echelon of the 14th Air Force, owes his life to the quick thinking and swift action of three enlisted men. Morrison was coming in to land after a routine flight. He made a sharp bank. His ship stalled, then slipped in. As the plane hit the ground, the belly tank exploded and the fighter was enveloped in flames. T/Sgt. Eugene R. Arvin, S/Sgt. Ralph J. Scott and S/Sgt. William J. Barowsky raced for the plane. "I could see the captain's head lolling out of the cockpit," said Arvin, and I was sure he was dead. When we got to the plane, Scott and Barowsky jumped on the wing and started to haul the captain out, but he was caught. I ran around to the other side and half climb into the cockpit. His leg was caught under the seat. I reached down and tugged it loose and Scott and Barowsky hauled him out of the plane to safety." When Scott was asked why he went out to make the rescue, he quipped, "I was after the knife in the jungle kit." Arvin remarked, "We were just the first ones there." Barowsky said laconically, "Just duty." Confirmed: The fact that the Roundup has bee contributing toward C.B.I. morals with its weekly page one cheesecake presentations. Photographers from the Army, Navy and Marines recently assembled at the studios of movie producer Sam Goldwyn, where they took pictures of 34 luscious girls posing in what the Army News Service termed appropriate costumes. Said Goldwyn: "The pin-up picture has become an item of morale. The studios are swamped with requests for them." The pictures will be sold at Post Exchanges and ships' stores and serviceman's funds will get the proceeds. In line with Goldwyn's observation, two high-ranking officers from Chungking raided the Roundup office this week with an insistency with which we hope the forthcoming Burma campaign is opened. Their mission was accomplished - acquisition of cheesecake pictures to bring back with them to China. WASHINGTON (ANS) - The Navy Department revealed that the United States fleet has been expanded into the mightiest surface armada in world history, with 13 times as many vessels as it had three years ago and an air force of 18,269 planes. The following statistics were revealed: (1) The Navy, despite losses and transfers to other nations, has a fleet of 14,072 vessels, including 613 fighting ships; three years ago the fleet's stength 1,076 vessels, including 385 warships; (2) On July 1, the Navy had an air force of 18,269 planes after writing off 6,800 as lost or obsolete and transferring 2,100 to other agencies; three years ago the Naval air arm had only 1,744. "No naval construction program of comparitive size and speed has ever been accomplished by any other nation," said the Navy Department. Two prominent Americans, a war leader and a statesman, gave an indication today of impending action in the C.B.I. Theater. Speaking at a war bond sale rally, Gen. George C. Marshall stated: "In the C.B.I. Theater, we are taking up positions to carry forward heavy fighting against the Japanese." From Secretary of State Cordell Hull came the statement: "The Chinese, as soon as they get more weapons, will drive the Japs from their soil." Last week the weather over Burma was still bad, hampering operations of the 10th Air Force, but activity was widespread and on a much larger scale than the previous week, in spite of adverse conditions. Japanese communications and rail facilities received the brunt of the pounding. Our aircraft ranged over all Burma in their attacks. One of our planes did not return to its base from a mission made in unusually bad weather. 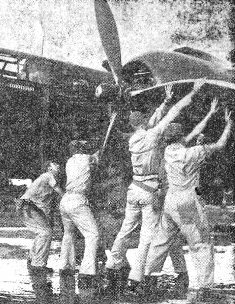 B-24's were attacked by a number of Jap fighters following a raid on Thanbyuzayat and several of the interceptors were damaged. No confirmed or probables were claimed because of poor visibility. Delayed reports of heavy bomber operations on Sept. 19 tell of a follow-up attack on Monywa shortly after it had been plastered by the B-25's. Fires from the medium attack were still burning with smoke rising to 6,000 feet when the B-24's came over the target. They added to the carnage with sixty hits on warehouses, tracks and rolling stock. Light high explosives were rained on barracks. Mediums and fighter-bombers combined in pasting Lonkin in northern Burma, and the P-40's left a large fire burning at Ningchangyang in the same area when they bombed and strafed an enemy supply installation. Only fair results were reported by the heavies when they delivered 20 tons of bombs on the Sagaing ferry terminal on the 20th. The weather was responsible. The mediums delivered a heavy attack on Naba Junction, Indaw and Katha, rail and shipping centers a few miles apart, where low-level bombing destroyed storage buildings, rolling stock and trackage and left many fires burning. Direct and near hits capsized and sank a large boat in the river at Katha. Fighter-bombers ranged over the Hukawng Valley in northern Burma, bombing and strafing targets at Ningbyen, Yungyang and Tabawng Ga. The heavies and the mediums made a concentrated attack on Wetlet on the 21st with excellent results. The bomb pattern blanketed the yards and heavy destruction of installations resulted. Many nearby buildings were leveled. Other B-24's made a series of sorties in the Mandalay area, including raids on Hsipaw, Shwebo, Zigon, Ywataung and Male. Sedaw was the objective of the B-25's the next day. The reversing station there was seriously crippled by direct hits of the south switchback. Direct hits were also made on the switch house and tracks in the center of the yards were destroyed. A single B-25 bombed and strafed the Mu Canal bridge at the same time, damaging it considerably. This same plane put two locomotives out of commission a short distance from the bridge by strafing. Mediums paid another visit to Katha and Nabo on the 24th. Five river boats absorbed a direct hit and several near misses at the former place. Trackage and rolling stock were so much debris at Naba. The next day, they demolished four barracks buildings and damaged two others at Maymyo. It was from these operations that one of our planes failed to return. The heavies were out in force at the same time attacking the yards at Thanbyuzayat. Leaving the target, they were jumped by a number of Zeros whom they engaged in a half-hour battle. Several of the enemy planes were damaged, but visibility prevented any claims of confirmed or paobable victories. On the 26th, heavy bombers subjected Letpadan to a methodical pounding. Nearly 40 tons of bombs were dropped with fine accuracy and tracks, rolling stock, engine sheds, yard buildings and adjacent warehouses went on the scrap heap. Numerous fires added to the destruction. On that day and the next, the mediums duplicated the results on Letpadan by giving Kyaukse a similar going over. Other formations on the 27th successfully attacked Pyawbwe. Twenty-five freight cars were demolished along with tracks and several small buildings. Many fires were left burning. ASSAM - Going Emily Post one better, 1st Sgt. Gutierrez recently inaugurated a special dinner service, complete with white table cloth and gleaming silverware for gourmets of the first three grades. Served by picked wallahs, they now dine in a splendour that outshines that of neighboring maharajahs. No longer does one hear the racous shouts of G.I. 's who want us to throw them the butter, following up this crude request with "an' let's have the gravy down here, Jackson." Yes, all this is changed. When we of the last four grades saw the table, we were all properly impressed. We sat through the ensuing meal barely tasting our food, wondering what general and his staff were about to honor us with a visit. Conjecture ran high. Some had it Gen. Stilwell was in the area; others of a more optimistic point of view had it Madame Chiang Kai-shek was going to make a brief visit and would give an informal speech. Others went in for a movie stars theory. But none of us were prepared for the formal entrance of the first sergeant, followed closely by the rest of the first three graders. They took their seats amid an awful silence, while the writer poured what remained of his glass of water over the recumbent form of Cpl. Krancevic, who had passed out, what with the excitement and all. Pfc. Rothfischer, who was presiding at the head of our lowly table, was removed immediately and is now in the hospital, suffering from acute hysteria and protesting that he won't eat again until he, too, has a table cloth. As for the rest of the boys, they're slowly recovering and endeavoring to improve their table manners. But all in all, things aren't the same anymore. If I catch myself saluting the first sergeant again I'm going to tie my arm down. 'PHOTO JOES' PROVIDE EYES FOR 10th A.F. UNITED STATES AIR BASE, INDIA - Armed only with an ability to attain high altitudes and outspeed any plane the Japs possess, single-seated American aircraft fly over Burma daily, photographing enemy installations and shipping which American bombers and fighters rip apart a few hours later. These aircraft are called "Photo Joes." They are the eyes of the 10th U.S. Air Force. The young men who pilot the "Photo Joes" are busier than a one-armed paper hanger with the itch. They sit in one place - unable to squirm more than two inches in any direction - for as long as nine hours. They keep their hands on the controls and watch the instrument every second, without the aid of co-pilot or automatic pilot. A "Photo Joe" has more instruments than a four-motored bomber, in which nine or 10 men are available for checkups. The "Photo Joe" pilots do their own navigation. They take their own pictures. When over enemy territory, they scan the sky constantly for Jap fighter planes, in addition to keeping on constant alert for juicy targets. Commander of the "Photo Joes" in India is maj. Dale Swartz, 39, of Spokane, Wash., who has been flying all types of planes since 1923. Swartz shuns personal publicity, but jumps at any opportunity to praise "the boys." "They are doing the toughest kind of flying in the world and I think they're just about the best in the world," Swartz declazred in an interview. "The boys have photographed virtually every inch of Burma," Swartz explained. "In addition, they have 'shot' pictures of important objectives elsewhere. They take great pride in their work because they know bombing successes are predicated upon good pictures." The "Photo Joe" pilots each fly over Burma two or three times a week. They seldom are intercepted by the Japs because they flash past long before the Japs can get into the air. "The Japs fired some ack-ack at me one day," said Lt. Robert Martin, "but I didn't lnow about it until I landed back at base and found three holes in my plane." "We're busy all the time we're in the air, but we really get busy when we're intercepted. We have to look in all directions at once. When we get back, our necks are sore from turning around so much." Capt. Don P. Webster told how he was intercepted over Rangoon one day: "I looked up from my instrument panels and saw a Zero on my right and one on my left. I pushed the throttles forward and dove. The Zeros couldn't keep up. They followed me many miles, but didn't have a chance of catching up with me - thank God! The only way they can get us is by surprising us - and we don't surprise easily." Lt. Russel Miksch said he had been flying over Burma a year without interception. "Sometimes, just to break the monotony, I wish the Japs would try to catch me," Miksch said. "I'd like to show 'em up." 14TH AIR FORCE - Capt. Loren S. Nickels came here thirsting for action... and he got plenty of it the first time he went into action as co-pilot of a B-25. He not only earned the plaudits of Lt. Hempe, veteran pilot of the Mitchell bomber, but he also earned a Purple Heart as a result of the mission. Here's the way Nickels tells the story: "As we made the turn from the target, bullets smacked the glass in front of and even behind me. The cockpit was filled with flying glass, but Hempe never moved a muscle and kept us in tight formation. The bombardier, Lt. Dearth, received a scalp wound. The rear gunner was hit in the rump by shrapnel. Some damage was done to my left hand and arm. "Five minutes from the target, our left engine failed and wouldn't feather. We nosed down for air speed and lost altitude rapidly, seeking cloud cover. After a half hour, we were down to 3,000 feet and considering bailing out or crash landing. But we decided to bring the ship home. "Two P-40's stood guard and led the way for the last 50 miles. We had so little altitude that we had to fly up and down valleys to avoid even the smallest mountains. After two hours of single-engine sweating, we arrived safely home." The ground crew had the ship in good shape in short order, so the crew went out on another mission the same day. And down the hills, the brooklets. And mince, from objects varied. That comes, we say, from hunger. "Old boy, you are looking quite beat. And sleep through this afternoon heat." Befuddled, his neck in a crease. "Now this can't be right, sleep is only for night. Thank God, advice is not part of lend-lease." By Lt. ELIZABETH SHAUNTY, A.N.C. A zoot-suiter was recently defined by the irrepressible Tokyo radio as an "American isolationist willing to shed his own blood to foster ideals against the war." "The American zoot-suiters are isolationist and anti-war fighters," said the broadcast. "They are strong, courageous young men who have banded together in a nationwide army to express by physical force their disapproval of the war. They are not afraid to spill blood - even their own blood - but they are intent upon spilling it in their own country for their own sacred ideals." "Upon the 12th, large American bombers raided North Chishima and Capt. Jiro Yokozaki received a letter of thanks from the C-in-C of that region for dashing to meet them. This has been reported to the Throne. "HE HAS BEEN PROMOTED POSTHUMOUSLY TO MAJOR."